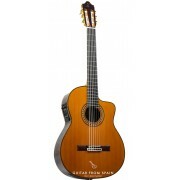 Raimundo 125 LH Left handed Flamenco guitar. Student series Raimundo 125. Ideal for students and beginners. Great flamenco guitar at an affordable price, with the lively and brilliant sound characteristic of all quality flamenco guitars. Solid spruce top, Sycamore back and sides and rosewood fingerboard.